Real Estate Developer, Architect, Philanthropist. 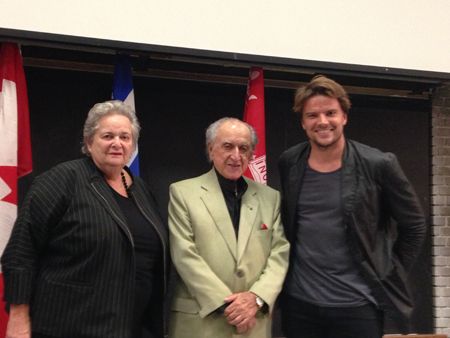 Benefactor of the annual David J. Azrieli Lecture in Architecture. Please read the notice on the CBC website. I am honoured to pay tribute to David Azrieli, who passed away last July. My colleague Aaron Sprecher and I had met him for lunch just a few months before he died, and he seemed, as always, solid as a rock. As a matter of fact, that is probably the most durable impression that David Azrieli left me: a sense of extraordinary strength and robustness, some contemporary incarnation of Emerson’s idea of self-reliance. David Azrieli believed in his own thought, and built an empire out of that sense of self. He was a real-estate tycoon, becoming one of Canada’s richest men. Many of us architects tend to think of developers as money-seeking speculators. Profit is of course a major motivation, as it certainly was for David Azrieli. But in my own personal contact with him, I also saw a man who was interested in shaping the world around him, and in doing it well, in a way that would appeal to people. After all, real estate is a profession that engages many fields: business and finance, of course, but also engineering, architecture, urbanism. David Azrieli wanted to keep in touch with all these aspects. David Azrieli was especially passionate about architecture, and that is why he so very generously endowed this lectureship to the School of Architecture at McGill University. This love of architecture probably stemmed from the tragic circumstances of his early life: at the onset of the Second World War, when he was barely 17, he had to flee his native Poland, and he remained on the run for more than two full years until he finally succeeded to safely reach British Mandate Palestine. Once in the land soon to become Israel, his first thought was to enrol in architecture, which he did at the Technion from 1943 to 1946. For him architecture was quite literally about building a future, with a sort of wilful optimism and without looking back. His studies were interrupted and he fought in the 1948 Arab-Israeli war. He eventually decided to immigrate to Canada, arriving in Montreal in 1954 without a penny to his name. He started by working for architects, but soon decided to start his own real estate business, beginning with small residential projects, moving rather quickly to larger apartment buildings, and finally building shopping malls, on which he made his fortune. His work in Montreal caused some controversy, but as I said, for David, architecture was entirely future-oriented. I first met David Azrieli when he came knocking at my office door when I was teaching at Carleton University’s School of Architecture. That was in the mid 1990s. He was almost 75 by then, and was fully established as one of Canada’s two or three most successful developers. Of course I had absolutely no idea who he was. He came by himself, modestly seeking admission to our M.Arch. program. He showed me his architectural work, drawings that he had done at the Technion in the purest Bauhaus style of the 1930s. Needless to say I was fascinated. He was admitted to the program and he proved to be a very good student. He never missed a lecture or a seminar meeting, driving on his own from Montreal for classes. It took me several weeks before I clued in to his true identity. But even then I treated him as any other students and I believe David appreciated that. These days every week spent at the University was a sort of interlude within his life in big business. He wrote an interesting 200-page thesis on Victor Gruen, who, somewhat like David Azrieli, was a European-born architect who fled the Nazi regime and immigrated to the US and became famous for pioneering the concept of the regional shopping mall. Gruen allowed David to think and theorize about the sort of work he had already carried out. In our conversations, he was of course highly opinionated. But it remained a true exchange. He successfully defended his thesis in the spring of 1997. When I moved from Carleton University to McGill University in 2001, I asked David Azrieli if he would consider funding a lectureship under his name. After some negotiations back and forth, he generously accepted but not without challenging me to find a way to invite Daniel Libeskind, who was then at the peak of his stardom. With the help of my colleagues, I was able to do just that, and David was very pleased. This year is the twelfth edition of the Azrieli lecture. It is worth listing them all: Apart from Libeskind, we had Steven Holl, Glenn Murcutt, Mendes da Rocha, Moshe Safdie, Michael Rotondi, Peter Eisenmen, Shigeru Ban, Thom Mayne, Juergen Mayer and, last year, Bjarke Ingels, an architect who particularly impressed David Azrieli. I want to thank David Azrieli and the Azrieli Foundation for having made it possible to bring us this impressive list of star-architects.